This workbook is aimed at companies in which technology has a significant role. It is intended to help these companies evaluate their process for gathering information about technologies relevant to their business. If your company does not have a formal technology intelligence system, this guide can help structure your thinking about how to create one. This book will guide anyone in the company who makes decisions about the use, development, or selection of technology, or who is involved in gathering technological information to review their current intelligence activities. A more complete portrait of technology intelligence activities will be drawn if a broad crosssection of decision makers and technologists answer the questions provided. Chapter One provides background, including a definition of technology intelligence. The next two chapters constitute the main body of the guide: company context and search methods. Each of these sections is followed by questions that will help you to assess your technology intelligence system. Once you have identified areas for improvement, you may find tools for addressing common problems in Chapter Four, together with supporting materials provided in the Appendix. This guide provides conceptual tools for assessing and improving your technology intelligence activities. By working through the questions in Chapters Two and Three, the reader will develop an understanding of the company’s intelligence needs and activities, and identify areas for improvement. The activities in Chapter Four and the company examples throughout the workbook. 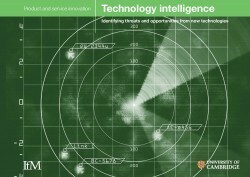 Read about research into technology intelligence in the Centre for Technology Management. Find out about support services available.